Red Black Radio Access Switch - Orion Systems Inc. The Orion Systems Red /Black Radio Access System routes secure and non-secure audio along with command and control radio status (cipher select, mode indicate, and cipher detect) commands to multiple COMSEC devices such as the KY58/100, KYV5, & PRC117G radios. A Console Operator selects the operational mode (plain / cipher) of each radio type. The corresponding radio interface reply’s with mode indicate (plain / cipher) along with a cipher detect indication which are displayed at the operator console for each radio interface. 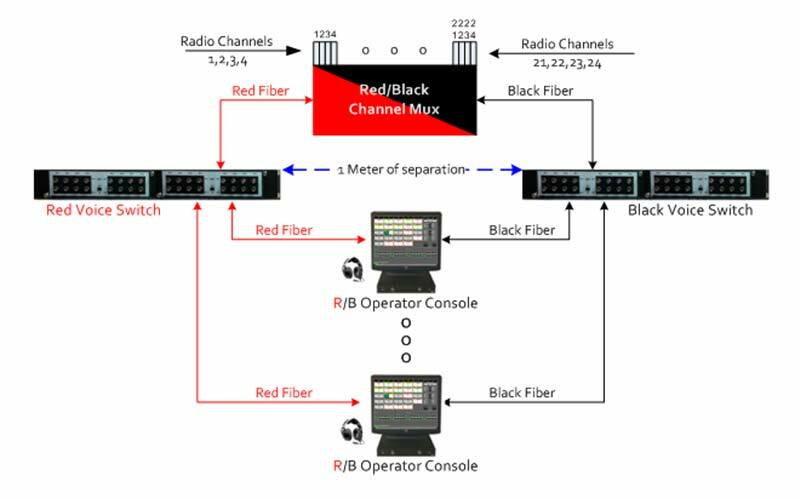 The Orion Systems Red/Black Radio Access System consists of separate Red and Black Voice Switches, a Red/Black Channel Multiplex, and multiple Red/Black Control Panels. The Red /Black Radio Access System adheres to NSTISSAM TEMPEST/2-95 red/black isolation of -100db and has successfully past Tempest certification by a certified Tempest lab. Ready to discuss your needs and ideas? The Red/Black Radio Access System shown above consists of separate Red and Black Voice Switches. Each Voice Switch is comprised of a 1 rack unit chassis, motherboard, and fiber optic modules. The Voice Switch can be equipped with either 1 or 2 fiber optic modules. Each module supports up to 8 fiber interfaces for a total of 16 fiber interfaces per chassis. Voice Switch chassis can be stacked to accommodate additional fiber optic interfaces. The Voice Switch equipment is built with redundant common components such as dual power supplies, dual voice processing logic, and are equipped with a main and standby microprocessor. The Black Voice Switch is shown on the right hand side of the drawing and processes only plain/non-secure radio traffic. Fiber Optic interfaces interconnect the Voice Switch to each Red/Black Operator Console (black side) and the Red/Black Channel Multiplex (black side). The Red Voice Switch is shown on the left hand side of the drawing and processes only cipher/secure radio traffic. Fiber Optic interfaces interconnect the Voice Switch to each Red/Black Operator Console (red side) and the Red/Black Channel Multiplex (red side). The bottom of the figure to the left shows multiple Red/Black Operator Consoles. Each Red/Black Operator Console is comprised of an electronics chassis and an all-in-one touch Windows PC. The electronics chassis is a three chamber device consisting of a red chamber, black chamber, and a headset chamber. The red and black chambers interconnect to their respective voice switches. The headset chamber contains lock-out circuitry used to direct the operators transmit audio (microphone) to either the red or black chamber but never both simultaneously. The electronics chassis is 1 rack unit high, has 2 front facing headset jacks, and includes a rear mounted footswitch connector. The electronics chassis can be either rack mounted or desk mounted. The headset interfaces can be set to operate as supervisor/trainee or equal capability. The all-in-one touch screen PC contains Windows 7 as its operating system. 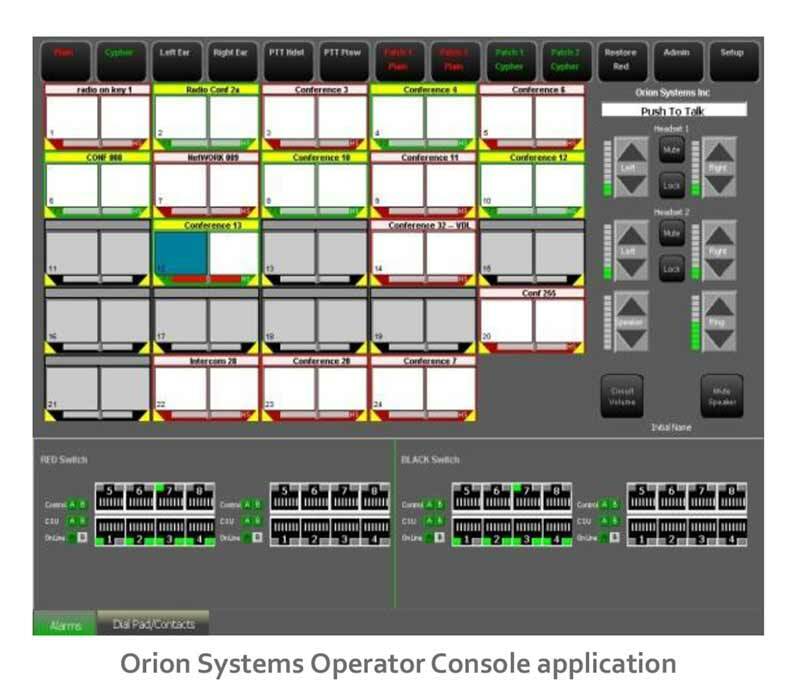 The only program required to be installed on the PC is the Orion Systems Operator Console application. The all-in-1 PC can easily be locked down to meet IA requirements. Operator Consoles features include Per Circuit Volume, Patch, Audio Present, Binaural Headset, Left & Right Ear circuit selection, Multi-Monitor, Multi-Talk, and Per Circuit 18 Character Label. 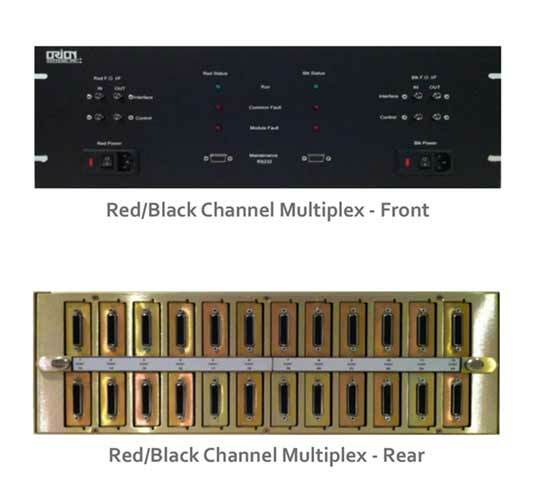 The Red/Black Channel Multiplex is an electronics chassis comprised of a red chamber, black chamber, separate red and black power supplies, and 24 individual radio interface modules. Each radio interface module is housed in a self contained ferrite enclosure designed to exceed the -100dB of isolation across adjoining radio interfaces. Each radio interface module contains lock-out circuitry which directs radio audio to either the red or black side of the Channel Multiplex but never both simultaneously. The direction of the audio (cipher / plain) is controlled by the console operators selection of plain/cipher select and follows the encryption devices mode indicate and incoming radio cipher detect. Separate red and black maintenance ports are provided which are used for setup, configuration, and the ability to directly read the radio status information. Setup and configuration such as gain/attenuation level settings for Tx and Rx are adjusted and stored within each radio interface module.